Prepared Marketing is continuing to expand its business in Newberg. 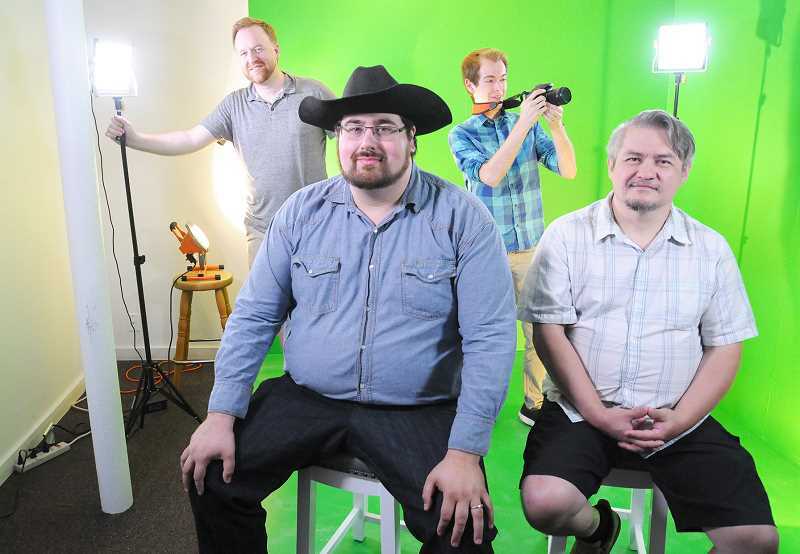 The business started in founder Ken Cook's home about six years ago, then moved into an office on Hancock Street and recently took over the other side of the building and constructed a video recording studio with a green screen. Cook started the business from scratch after graduating from George Fox University. He and his crew have put lots of sweat equity into the business. "I like to read books and I read a lot of books," Cook said. "That is how a person learns how to do things and this is how I learned to do this." There are dozens of marketing firms in the Portland area as the market has expanded with the growth of the Internet, Facebook and Google. But Prepared Marketing is not your typical marketing firm. They do what they call adaptive marketing, which includes business growth concepts such as finance, acquisition costs, profit and loss statements, etc. "We are full service marketing agency that specializes in analytical marketing," Cook said. "It is more of a numbers side of things and less of pretty pictures. When you hire a marketing firm, you are hiring pretty pictures. But what they can't do is run the numbers and ask, 'How does this drive profitability?'" Cook said he believes that most marketing companies cannot or do not provide the services needed to grow a business, they do. According to eMarketer, digital spending is forecasted to jump from $83 billion to $129.23 billion in 2021. If a company like Prepared Marketing does not have borders, then the world is its market. "There are a lot of metrics. I have a company that we work with and in the past decade they had 150 million visitors. Can you use that to predict their revenue?" Cook said. "That is the challenge. You can have beautiful pictures all over the Internet and on your website; we measure the impact of these things and not just give you a nice picture that you love." The goal is to draw revenue and Cook said it involves more than tactics, more than advertising on Google or Facebook, or developing websites. Businesses need the capital to deal with growth first, and then marketing. If a firm can bring in the business then it is important that a company can handle the growth. Prepared Marketing looks at these things before taking on a client, Cook said, adding that businesses are failing not because they have a bad product, but because other pieces are not working well, such as finance, marketing and operations. "So for me it is integrated. Your marketing has to do certain things, but your marketing has to do with finance," Cook said. "And there are so many agencies that do not include this. This is Business 101. You have to understand 'What is my acquisition cost? ', 'What is my gross or net profit?' Most marketers don't touch that and at the same time they don't touch the operation side. They don't understand the business." Prepared Marketing is located at 715 E. Hancock St. and can be reached at 503-213-3100.